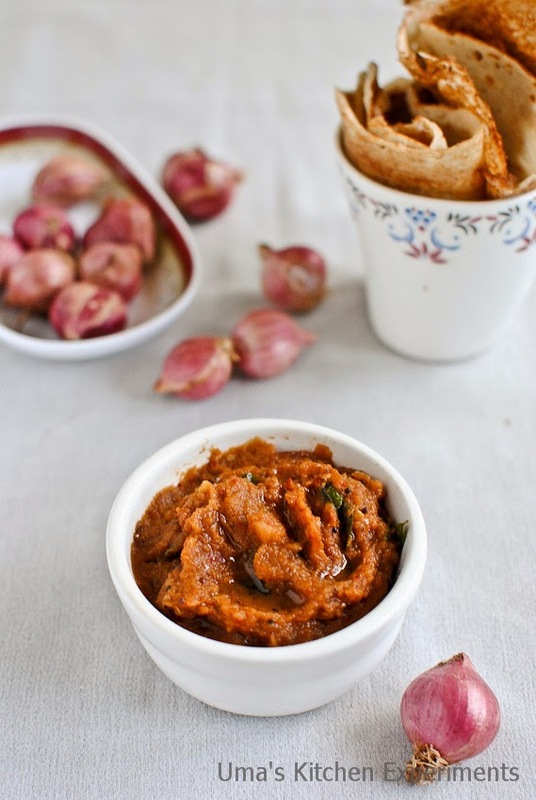 Chutneys are quite common in every south Indian Household. Idly/ Dosa being a breakfast at every home, one really struggles to think as what chutney to prepare for every day breakfast. My mom always used to wonder what chutney to prepare for next day breakfast as she gets into this thought every time after finishing her dinner. This is surprising to me as she has a good number of chutney varieties at her hand. Even if she prepares those chutneys on a routine basis, we don't get bored or don't even know if it is getting repeated because of its good taste. When I started cooking on my own, even I was drowned under the same thought as what to prepare for next day's breakfast. The ingredients involved in preparing the side dish matters a lot here. I can't go with preparing Ridge gourd chutney without having ridge gourd available at my refrigerator. So what I planned was, I will prepare a list of day to day chutney recipes and will post it regularly in my blog. One can refer this blog, even based on the ingredients available at your home and prepare any kind of chutney as you like. 1) Peel the skin of onion and garlic. 2) Add onion, garlic, tamarind, dry red chillies and one spring of curry leaves(First five ingredients from the ingredients list above) to a mixer. Grind it to a smooth paste by adding enough water for grinding. 3) Heat oil in a pan. Add mustard seeds when the oil is hot and not smoking. Add curry leaves and let it become crisp. 4) Add the ground paste, asafoetida and salt to taste to the pan. Use little water to rinse the mixie jar and pour it to the pan and Mix Well. Cook till the raw smell goes off or until the required consistency is reached. I like my onion chutney to be thick. So, I cooked till it reaches a thick consistency. 5) Serve with idly or dosa. 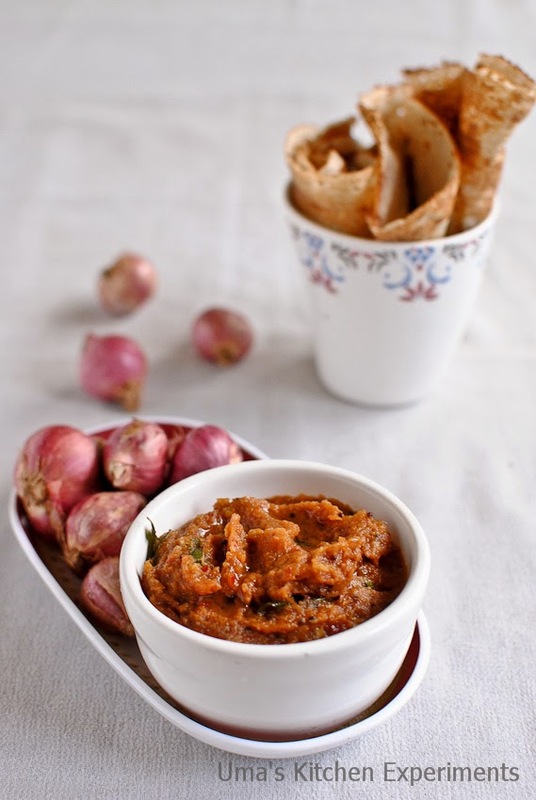 We had this chutney with Sorghum dosa. 1) Adjust the red chilli quantity as per the taste. Colour of the chutney depends on the red chilli you use. 2) If you don't get shallots, you can replace it with red onion. But, you need to compromise on the taste as red onions don't provide the same taste as shallots. 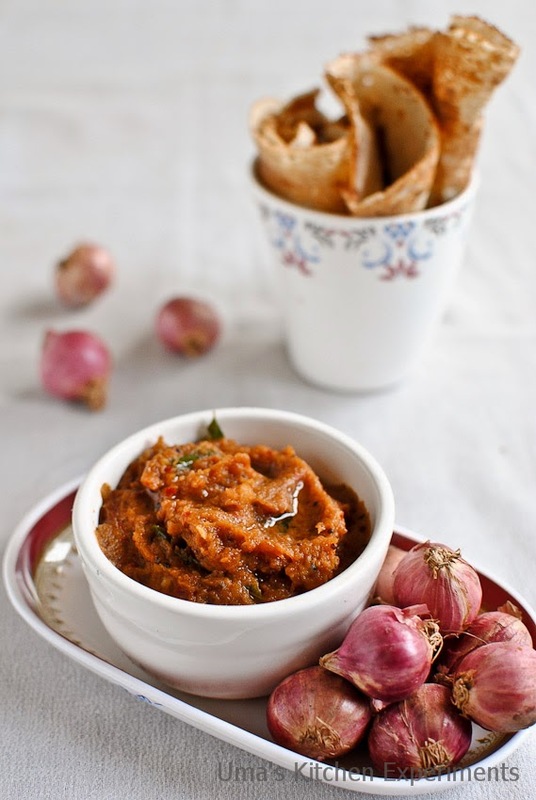 Onion chutney looks tempting and delicious!! Looks tempting....... Perfect with roti!! 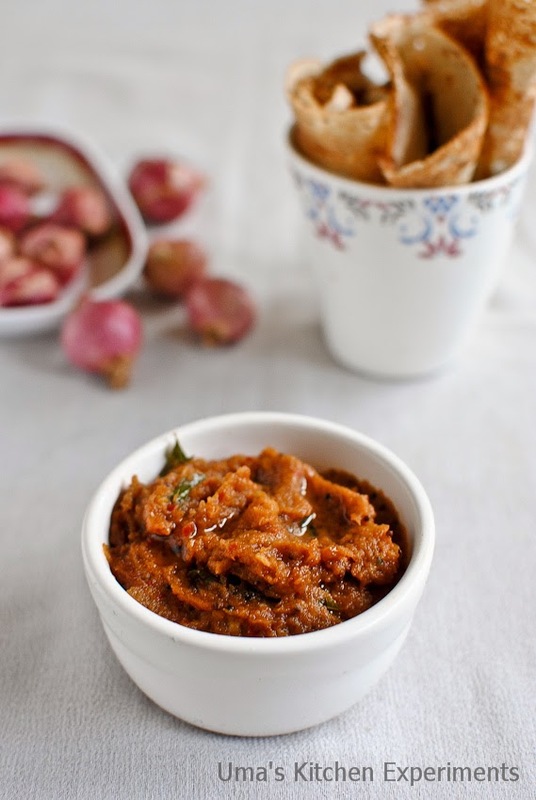 Such an irresistible chutney..Mouthwatering here, wat a terrific side dish. Tempting chuntey. Would love to have it with dosa..
yummy chutney and awesome clicks. Good work. Love your clicks, especially the last one. I sometimes add tomato instead of puli.....yum! simply mouthwatering and delicious looking chutney. We lived in India for many years and my daughter loves chutneys. I have never tried making it a home.